Are you getting ready to apply for CARF Accreditation? Many organizations prefer to begin the process with a Mock Survey to help determine where they are in their preparedness. Also, Mock Surveys can be helpful shortly before the actual survey to ensure that all things are ready. The Mock Survey is usually conducted over a period of one to two days and is designed to offer the "feel" of an actual CARF survey. Policies and procedures, and relevant plans are reviewed, programs are surveyed and interviews are conducted with staff and persons served. The facilities are closely surveyed for issues in accessibility, health and safety. To ensure conformance to CARF Standards, various polices and procedures are needed by the organization that meet and serve the needs of the organization. Washburn Consultation strongly believes that policies and procedures are most helpful when they belong to the organization and are developed specifically for its needs. By sharing information electronically, this service is often less expensive because it can be provided off-site. 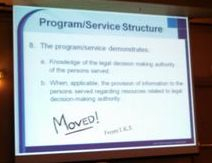 Depending upon services offered, program descriptions often reflect issues within the local environment: state regulations, local and regional expectations, and expectations of the stakeholders. Washburn Consultation assists the organization is developing these to meet these needs and certainly to clearly identify the services provided. Aspire to Excellence requires various business plans to enable the organization to address business needs. Consultation assists the organization in developing plans which address these needs which then encourages excellence in its business practices. Again, the development of plans and other documents is often less expensive because it can be provided off-site. Washburn Consultation is prepared to assist the organization in identifying training needs, which may then be developed or delivered by Washburn Consultation. Training may be prepared in electronic format or in person training, depending upon the nature of the needs and the desire of the organization. Many questions are likely to arise during the CARF survey preparation process. Washburn Consultation offers assistance with these questions: Where does our program best fit in the programs from Section 3? How many surveyors will we need for our survey? How do we best present all thus information for the survey? What should we make available for the survey? These questions and others will be addressed in consultation. Sometimes on site meetings are needed or wanted, but also electronic communication (cell phones, email, fax...) ensures that questions are addressed quickly!